Experience area and exhibition space built over a site of approximately 1,322m2, will be opened as early as the end of next month. 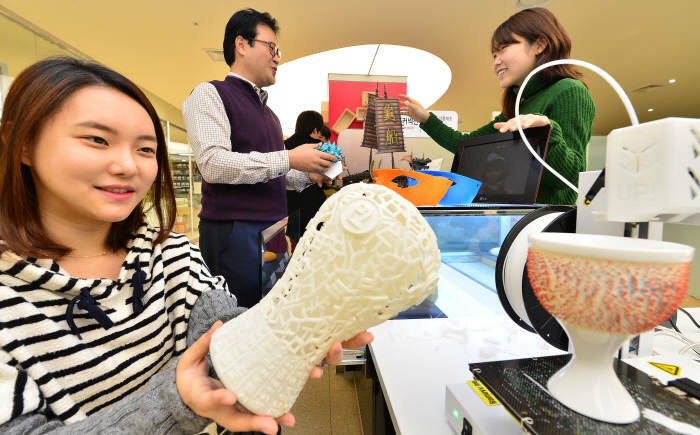 A large-scale 3D printing experience area will be installed in ‘Yongsan Electronics Shopping Mall,’ a center of electronics industry in Korea. This is anticipated to produce synergy as the government is accelerating 3D printing industry development as a next-generation growth item. According to the industry, Najin Industries will build ‘Cooperative Space of Infinite Creativity’ including a 3D printing experience area over a site measuring approximately 1,322m2 on the ground floor of Najin Shopping Mall Building 14 inside E-World in Yongsan, Seoul. This project was planned and has been promoted by Najin Industries, an E-World management company, since last year. This facility will be opened officially at the end of next month or early March at the latest. Cooperative Space of Infinite Creativity will offer a range of 3D printing related facilities in order to develop Yongsan into the ‘Mecca of 3D printing.’ This facility will comprise of ‘Seoul 3D Printing Experience Center’ together with a remote controller store, an education and experience center, a seminar room and an exhibition and event space. 3D printer developers Carima and Rokit, a 3D modeling program manufacturer and distributor Inteli Korea, a 3D scanner maker Onscans, a 3D printing solution provider STL and a 3D design provider Sculpy will open shops in the facility. The tenants in Seoul 3D Printing Experience Center can receive information about equipment, material and market trends from industry experts. Najin Industries has set out a policy to continuously increase tenants. The government, through private – public joint effort, will promote a project to intellectualize and optimize entire production processes in 10,000 plants of small and medium-scale manufacturing companies by 2020 with an investment of KRW 1 trillion. The goal is to foster the three soft powers of manufacturing industry, which are engineering, design and embedded software, into new innovation industry to continue on the success of materials and parts industry. On the 26th, the Ministry of Trade, Industry and Energy (MoTIE) announced ‘Manufacturing Industry Innovation 3.0 Strategy for Creative Economy’ at a talk in Cheong Wa Dae with chairmen from the Chambers of Commerce across the country invited by President Park Geun-hye.